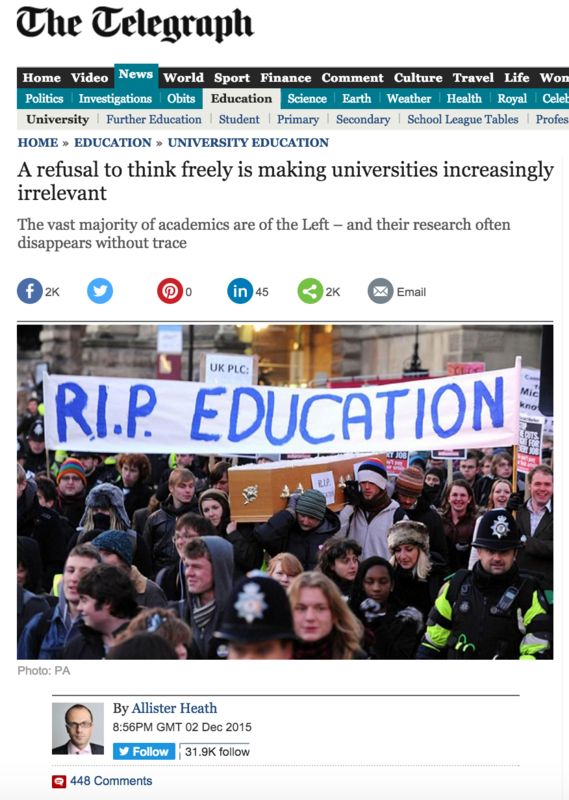 In a recent column  in The Telegraph, Allister Heath claims that the humanities and social sciences are suffering from increasing groupthink, inwardness and irrelevance – creating an environment in which certain political outlooks are suppressed and academic research rarely resonates beyond the hallowed halls of the university. Such an account simply does not square with the realities of universities in 21st Century Britain. Heath praises the University world of the twentieth century but then neglects the golden rule that drove that work and is still present in twenty-first century academia: make sure you have robust evidence to support your arguments. In terms of academic research, the supposed thought police of the left are in little evidence in the pluralistic university faculties that we know across the U.K., places in which rich debates over theory and methods take place. When it comes to Heath’s arguments over the narrow reach of academic research in terms of citation, Heath’s arguments rely on tenuous evidence. The claim that “98 per cent of academic papers in the arts and humanities are never cited in any subsequent research” comes from a twenty-five year old study that was at the time shown to have been misleading . The very pluralism that Heath argued is absent is what drives the abundance of contributions and the citation process is the way core arguments and perspectives emerge. In short we need the plentiful bounty to produce the nuggets of wisdom. Research impact now plays a central role in the day-to-day life of the modern academic. Emphasis on wider dissemination to public and policy audiences is now integrated into research council funding and the formal assessment of research quality in the government’s Research Excellence Framework. The 2014 REF reported that “research in all UOAs has led to a wide range of outstanding and very considerable social, economic and cultural impacts”, with 44% of submissions graded as world-leading and a further 40% as internationally excellent. Social sciences fared well in the REF, with the scores for Panel C  and the Politics & International Studies unit of assessment (UoA21 ) faring well in comparison to the national average – and indeed above the average score for sciences/engineering (Panel B). This hardly tells a story of irrelevance or a crisis of research impact. There is much evidence of the contribution of social scientists to policy-making in Britain, for example informing the nudge agenda and more widely providing an important evidence base for parliament . Claims about the irrelevance of the social sciences are baseless. Big ideas such as those around globalisation, governance and predistribution all had academic starting points. The work of think tanks and other policy advisors relies to a great degree on access to academic research. To say they, rather than academics, deliver policy advice it is a bit like arguing that all the bills, cards and letters you receive are generated by the postal worker that delivers it to your door. It is certainly true that the political outlook of universities is to the left of the median voter  – regardless of discipline . This arguably reflects the self-selection mechanisms at work in pursuit of an academic career, rather than a suppression of particular political viewpoints. Having sat on more interview panels than we care to remember we can remember no cases where a candidate’s politics mattered. Decisions are driven by pragmatic rather than ideological judgements about the quality of their research, their capacity for academic leadership, their teaching commitment and their ability to raise funds!